oonaballoona™ | by marcy harriell: you want the quilt? YOU CAN'T HANDLE THE QUILT! you want the quilt? YOU CAN'T HANDLE THE QUILT! I have a lot of scraps. A LOT. The most precious of which are housed in Ruggy's grandmother's pink Samsonite train case. (This is fitting, as we also have eleven quilts made by that pink lady's mother, safely stored at Mama Ruggy's. And when I say safely stored, I mean she would not let us bring them home with us when she realized I didn't have the proper understanding of the value of great grandmother's quilts. Weeeelllllll, to be fair, she was right, I was going to use them for ACTUAL BLANKETS THAT PEOPLE COULD SLEEP UNDER but now I get it, they're heirloom and couldn't really take that kind of handling. It would be like wearing a vintage cocktail dress as a bath robe. I know I haven't done my roundup of my beloved Pfaff yet, and I swear I plan to. I do wonder about having enough space below the presser foot for multiple bulky layers-- do newer Pfaffs have more real estate there? But, can I give a ear splitting SCREAM OUT for the IDT system? It just works. I've quilted three jackets so far (only one has made it to the blog, more to come). No slippage, no bubbling, no worries. It could make quilting a joy. Got an opinion on quilting? Will someone with my absence of patience be able to handle this? Speaking for myself, quilting was my gateway drug to garment sewing, and I'd rather gouge my eyes out than quilt one.more.thing. I love hand sewing, but quilting made me crazy. (And yes, I'm a bit short on patience when it comes to finished projects). gateway drug! i love it! knitting was a precursor to garment sewing for me, and yeah, unless you're giving me a godzilla sized set of needles i'm out. Quilting is for Type As; knitting is for Type Bs. then i may have found my people. dragging them behind a car!? hopefully, doesn't end up on the bed ;). i'll check it out. i have an idea that i'd have to have, like, one quilting day a month to get it done. finished by, what, 2020? I'm sorry I can't really weigh in on the quilting question, except to say if you wanna do it just go for it. But I badly want your beautycase! Is it vintage Samsonite? it IS! and, get ready to weep, i had the matching large & small suitcases. they were left behind at a Councel thrift shop in LA. regret, i haz it. Gripper gloves. I even use them for coat making. For the record, I sleep under my quilts . . . even the one that is in shreds and needs to be replaced. I'll bring wine and scraps . . . quilting with company is better. whaaaaaaat madness is this? they make gloves for this?! 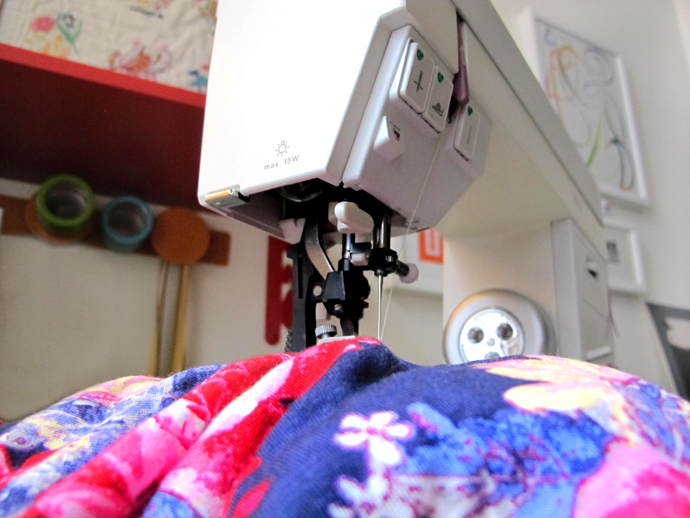 my pfaff has a fancy walking foot attached (that's the IDT system) and it's changed my outlook on quilting. so far though, i've done garment quilting. Gloves baby! Gloves. Seriously, the next time you make a coat it will change your life. Or jeans, with the bulk seams on and top stitching. Just get those gardening gloves that look like white cotton dipped in liquid latex from the hardware store. Sew mama sew ran a piece last year about notions from the hardware store which is really worth a look. so they help you grip the material...interesting...now, can i dye those gloves a techni-color? Ooh, I both want to encourage you and forewarn you... I consider myself to have a lot of patience, and sewing a queen-sized quilt almost broke me! That said, I was on a deadline - our house is cold, we needed another layer to pile on the bed and I wasn't willing to buy a quilt when I had so many scraps. Also, I desperately want to see your gorgeous scraps in quilt form! There's always the option of hiring someone to do the quilting portion for you. I could really see you getting into crazy quilting (no rules! use scraps of gorgeous fabrics! ), but it does involve a lot of hand work, which may not be your thing. I would definitely suggest taking a class or two on quilting to get you started, as quilters have ALL kinds of ways to make the work faster and more efficient. Once you know the tricks, you can churn out a quick quilt top in a day. You might also start with wall quilts, as they're a much more manageable size and much quicker to do. Having recently just jumped on the quilting bandwagon i can say that truly its a little bit boring! I mean who wants to sew the same thing over and over again when you can stitch up a couple of darts, slap in a zipper and have a party dress ready in a day?! The scraps called to me too, and i caved! too true! so, are you happy you did it? I've made two quilts. I loved making them - the first was for my God-daughter:) I'm definitely interested in making a few more. lol, i think you already know how i feel about quilting garment scraps! DO IT!!! i am actually gathering inspiration for a proper quilt right this moment! I've made one lap quilt and have 3 other quilts (2 baby quilts and throw quilt for my living room) in various stages of togetherness. My biggest suggestion would be to not set a deadline to finish it or set it far enough off that you're not panic quilting. Baby quilt #1 is for a baby due next month!! I'm totally dragging my feet on finishing it. My big long term project is a quilt for my parents. I'm planning on having it professionally quilted but I'll do the top myself. My goal is to have it to them by September 2016 for their 45th anniversary. I have most of the top pieces (yay for charm packs...precuts are the way to go for me at this point) so once I finish the other projects I'll start on the quilt. I like it because I can work on it a bit at a time and not have to finish it right now! oh yeah, i'm definitely thinking long term. and those scraps might be fun to play with when i want to sew but can't pick a project. hope baby quilt #1 is nearing the finish line! Lap size? Try starting w/ ATC (art trading card) size! Just doodle with your scraps on a small scale. I would start with a rail fence quilt. My impatient brain wouldn't allow me to start with a quilt with small pieces. They're just made from strips of fabric sewn together and will go much quicker than the hexagons. Quilting is just like sewing - you can whip up a quick top or faff around for months tailoring a coat. If you want to quilt impatiently, I suggest crazy quilting, which really is a thing!! Really! So there, they had us in mind all along. My fave easy one that looks amazeballs is log cabin, done all crookedly onto a muslin backing. Sew and fold over style. Suggest you go visit one of the incredibly fab quilting shops in NYC and do a class, just to get the basic ideas into the mind, or find a book or some such. Then you'd be off! I adore garment sewing, but quilting was my first love. If it's patience you lack (as do I!) that kind of hexagon quilt might not be the most fun for you... but you can have SO MUCH FUN with improv-pieced quilts and crazy quilts and scrap quilts and all kinds of nonsense. What's great is that there are quilts for people who like repetition and technique and for people who like slap-dash and random, and all combinations thereof. It's true that a well-made quilt takes time and money, but depending on your goal (whether you just want to use up scraps and get a blanket out of it, or whether you want to hone your technique) it doesn't have to be a tedious marathon. Right now I'm sewing a sampler block a week to avoid getting crazy bored of one pattern (and to avoid spending mad money on fabric), and it's working great. i think i might be a combo of improv & repetition-- i do like the idea of getting all those quilting lines straight over some crazy jumble! I hate quilting. When I couldn't get clothes sewn to fit me , I sewed doll clothes. Quilting is persnickety and never ending straight lines and repetition. Thank God, I figured out my fitting problems. i really would be happy to use up all those scraps. especially in apartment living, what am i doing keeping all these scraps?! paper piecing on a subway--- this is like learning a foreign language! I use my Pfaff to quilt and the IDT works great. The only problem I have is with a really big quilt, because there isn't as much room as I'd like to the right of the needle. But it's a small complaint. I like quilting because I don't set deadlines. If I'm sewing a dress, I want it yesterday. With a quilt, it gets done, when it gets done and that's kind of nice. Go for it! You may surprise the heck out of yourself. You will also really start to use all the decorative stitches on your machines. First few quilts... you'll cut your own pieces. If it takes... you'll look into Accuquilt GO cutters. Do you already have a good sized cutting mat? Cutting rulers? no cutting mat (i know!) but the top of my drafting desk is a self healing mat, i think. plenty of rulers, quilters corner the market in great rulers! I knew I wasn't into quilting but I try to take a quilting class. Half way through the class I knew it was not for me. That I would hate ever minute of it. What I like to do with my scraps is put them in clothing details or make clutches or such for gifting. Also someone I used to know took some of my scraps and quilted a wall hanging for my birthday. that's such a nice surprise! i've looked up a few guilds here. but then, the thought of carrying my pfaff there....i mean, because obviously i want to stitch on my girl :))! https://thequiltshow.com/ most are free to join and have lots of free content for beginners. thanks for those sites!! i'm not sure if i have that specific foot, though i do use my foot as a 1/4 inch guide all the time. it has clear inner edges for better accuracy. Gave up quilting when I had kids. Too long term commitment. But I can see doing it again when the kids are out of the house. I got around the monotony of making the same 20 blocks by changing the color or block style, or better yet, doing freeform quilts. And for some reason, while machine quilting bores the pants off me, I get all zen with hand quilting. It's relaxing like knitting, just without the counting. I think we're all waiting to see how Oona's quilt would be like :D so don't wait, girl, and give it a try with all your marvellous scraps! could it be Invidia or Gelosia the word you were looking for in Italian? maybe invidia! i have such a clear memory of my italian friends explaining it to me years ago, over pizza in rome, no less, but the word escapes me. Quilting is a bit fussy but rewarding. Those 1/4" seams have to be PERFECT to not come out wonky. I've made 2 quilts in my life. One when I was in grade 9 for the Christmas break and the other which took years because I couldn't get myself to do the hand stitching which takes a long long time. If you sew such fantastically fabulous outfits, then sewing a quilt would be a piece of cake. Just see it as a long term project. I think quilts look great on a bed and you created it. Your sense of color and movement would make you a formidable quilter. Here's the rub: the quilting takes forever and can be frustrating as all get out on a regular sewing machine. I love to design quilts and make the tops but the quilting? Meh. After years of stubborn refusal and a growing pile of UFO's, I decided that I would never get another quilt done if I quilted it myself, so I *insert gasp here* now send them out to a professional. Then I get to do the fun part (design/color/movement) and someone else does (a much better job) the not so fun part. One tip: consider not sending them to someone locally, since it will cost a fortune. Find someone in a less expensive part of the country. It might even influence your decision to know that there are collectives of women (google Gee's Bend, it'll change your life!) who do that. There are also many pretty accomplished long arm quilters who do it from home and don't charge horrendous fees. It was so liberating to give myself a free pass! well thank you for that vote of confidence! and gee's bend looks like a magical place. those ladies of all ages hanging together, creating, i love it. I am well an truely camped in team quilt. I find patchwork soothing, you can just sew away without having to think too hard, and choosing designs is fun. Free motion quilting is super fun and by no means boring (but is tricky to start with), but mine often comes along with "weee, woosh" sound effects. I think if you choose your design carefully you would still enjoy quilting. Just don't pick a design that has hundreds of the same pieces, as you'd probably get bored of that. Thank you for the jealousy. Can't think of a better compliment for my quilt - which btw hasn't reached heirloom status and is my cuddle on the couch quilt. Btw, if you do decide to quilt - DO NOT start with an English paper pieced hexagon quilt. That will kill any desire for a new craft. Although the quilting was done on the machine with a walking foot, not by hand. you are most welcome! i promise not to start with a hexagon quilt. in fact, i might just start sewing random shapes together with fingers crossed! You can handle it but you have rewire your brain. Can you do that? Think of making a quilt the way a really great con artist would handle the long con....it can take years (probably more like months) but, man, you will be rich rich rich! Can't wait to see yours. And, Leah, who I've just added to my blogs, that is a fabulous quilt!!! HAHAHAHAAA quilting as a con artist!!! i love it! I made a quilt once! It took three days, because I was on fire and didn't have anything better to be doing. It was also a very simple nine-patch. I think quilting is fun, because color is fun, but then, I always let my mom do the actual quilting! I also made about half of a strip quilt; that was really fun because the piecing itself was really simple, and the fun came from choosing each new juxtaposition of fabrics. I'm sorry, but how are you going to model a QUILT? Take it out in Times Square and toss it around? Put a slit in it to show some leg? You, like me, sew in an urban envirnment, ergo we are not Ma Kettle. If you must, make a Chanel jacket out of fat quarters. Plenty of quilting in that. ugh, can i just say, i have zero desire to make a chanel jacket? i'd rather be ma kettle. i can appreciate them on others, but something about them on my body makes me want to grab a box of matches. I've just started my first "quilt", totally cheating though, it's going to be a double sided doona/ quilt/ duvet cover (still thinking about the reverse side)....and I'm smashing it with 6" squares, there were a lot of big prints, so it needed big squares. The most tedious thing with it so far is all the pressing open of seams. I'll back the "quilt tops" with homespun, to keep all those seams hidden and less messy, but won't use any wading, so machine quilting should be a doddle (comparatively). UM I'M SORRY THERE'S SUCH A THING AS A DOONA QUILT?! I can't handle the precise, exactly cut and sewn quilting .. AT ALL! But I've done really fun scrappy quilting sewing OVER thrifted/old sweatshirts and made a few happy, colorful, wacky, scrappy sweatshirt jackets. It's totally whimsical, freestyle and freespirited creating and sewing. You'd probably love scrappy quilting for all the reasons above. You can cut the sizes, shapes of your scraps and create whatever patterns you want, wherever your creative spirit leads you. It's FUN! In those projects, I typically used invisible thread = you don't have to = and just kept adding scraps til it was done for me.. Some pics of scrappy quilts - they do not have to have a uniform pattern, you'll see some just very random. to actually do the quilting together of the 3 layers = top, batting, back fabric = and bind it after you've finished your quilt top, if you don't want to do the entire job. Give a little piece a try = maybe a frameable wall hanging size, and see what you think. Crazy quilting is a whole other technique, typically with decorative stitches joining the pieces. I forgot that I'd made this really beginner crazy quilt large pincushion several years ago. In crazy quilting when combining different colors and color values in a project, I just remembered a tip I learned years ago, and that's to add some black and white fabric periodically, and the most disparate, seemingly uncoordinated color choices will work. joy, that jacket is so whimsical! and those links are so much fun-- i especially love the color wheel one (the link is crazy long, can't bitly it!). Quilting taught me patience and that patience transferred to my garment making, slowing me down a bit and resulting in fewer wadders. I piece by machine but do the quilting bit by hand in front of the Telly. I don't quilt as much now though, too busy making better garments, but probably make one a year as gifts. what a wonderful side effect. ruggy would certainly appreciate my gaining even an ounce more of patience. 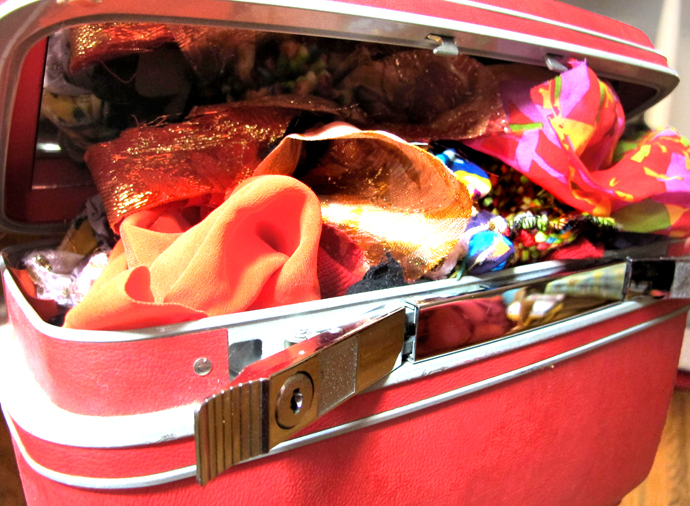 Hiya Oona, the contents of Ruggy's Granny's DELECTABLE pink suitcase, reminds me of the writhing, psychedelic, tantalizing mass that is my necktie collection. One day it'll blossom, and flower into some unique confection. I'm not sure quilting would every do it for me, as I need to see my "makes" take (relatively quick) shape before my very eyes, phoenix from the ashes style - but I certainly wish you luck in pursuing this dream. The Italian word you are looking for is probably "invidia" (envy), as another commenter has already said. But the simple noun doesn't convey the emotion you were getting at, so you need the expression, "Che invidia". "WOW, that Girl's quilting Rocks ... Cazzarola, che invidia!!!" that sounds more like the phrase-- if i'd heard invidia alone, i probably would have glommed onto envy & remembered it (she said, when she forgets what she walked across the room for). cazzarola translates to casserole! please tell me that's right, because that's an awesome exclamation. I'm with you. Seeing that rainbow coloured beauty makes me want to quilt too. I am ALWAYS tantalized by beautiful quilts (although I would totally sleep under mine). But fear that I really do not have the right personality. What kills me is all the cutting! So boring! And stitching little pieces together. And the repetition... okay, really just everything about it! I could actually really see you getting into quilting - planning out beautiful color combinations and crazy juxtapositions, sewing it just-so... especially if you give yourself the freedom to do a free-form quilt. I can see it now, and it's glorious! i heard that last sentence a la Will Ferrell, and it pleased me to no end. I enjoy quilting but sometimes, (like the last TWO YEARS) I lose my motivation for quilting. But at the same time I keep planning more quilts in my head. It's a kind of mental disorder, I think. HAHA!!! i get to sew AND get my workout done? I'M IN!!! The answer is yes. You can do it. Quilting is great for "I just wanna sew" robot-mode sewing. It's also great for the "omg look how much I've sewn" feeling (and you're only halfway through the project). Also the IDT works great with layers. I prefer quilting w/really thin batting like the one Leah probably used. No fluffy polyester fiber fill. I make a rule about scraps... anything less than 2" wide (like a strip) or smaller than my 4" square goes away. Period. Keeps me sane that way. As a long time quilter and occasional garment maker, I think you could totally rock the quilting thing. I'm guessing that case isn't full of 100% cottons, so I would think something like a string quilt would be the way to go. It would help stabilize all the various fabrics, and pretty much no matter how you put it together, it would be beautiful. You also wouldn't be dealing with so much precise cutting for your first project, and not so many seams to match. All you need to start is a bunch of muslin squares and start cutting your stash into strips of any size. UGH QUILTING NOOOOOOOOOO!!! OK, I'm jaded as I'm in day 2 of a baby quilt marathon project and have never wanted to quilt (like you, I'm rich in inherited quilts, from my mom, my great-grandma, and my husband's grandma). I hated myself so much when I was cutting out the blocks, but then actually sewing them and seeing the patterns come together was pretty fun. The actual quilting part? Kinda like trying to wrestle a toddler under your presser foot. Blech! dude no more self inflicted punishment sewing for you!! also, thank you for the image of a toddler under my presser foot. i have a few in mind. Keep in mind that like with sewing, there are many different and equally valid approaches to making quilts. Check out some books that feature quilts that are more improvisational and less focused on precision to get inspired, such as Unconventional and Unexpected by Roderick Kiracofe, or Signs and Symbols by Maude Southwell. You'll see some incredible works of art made in an un-fussy way. thank you for those titles! i think improv is the way to go. As a quilter (an occasional garment sewist) with little the no patience, you can totally make a quilt. I do recommend that you start small with something like a lap quilt. That way you can get some practice in and see how it works with your machine. Just avoid anything with a lot of hand work, like english paper piecing (those hexagons) for your first project. Do a pinterest search for Improvisational Quilting, and check out the NYC chapter of the Modern Quilt Guild: there's a whole new world of quilting out there that is liberated from traditional repetitive block sewing (which doesn't strike me as your kind of thing). Well, I'm a fool making a knitted quilt so what do I know? I started it last July and have made 3 pieces. wait, are you knitting blocks for a quilt? and then sewing them together?? I've been thinking this for a while too. I want to make a big pretty quilt! But do I want to put all that time into it?? Realistically, it's probably no more tedious than some of the hand sewn garments I've made, but it just seems more daunting because it's so big. nothing says "welcome to our home " like a graveyard scene quilt for the guest bed! Oh, I don't know. You might like it, you might not. I think you should try a small one, just to see. I'm taking a beginner's quilting class. It's okay. It's kind of fun. I mean, any sewing is good sewing, right? But for me, I can't see it taking the place of garment sewing. But I'm enjoying learning how to do it. 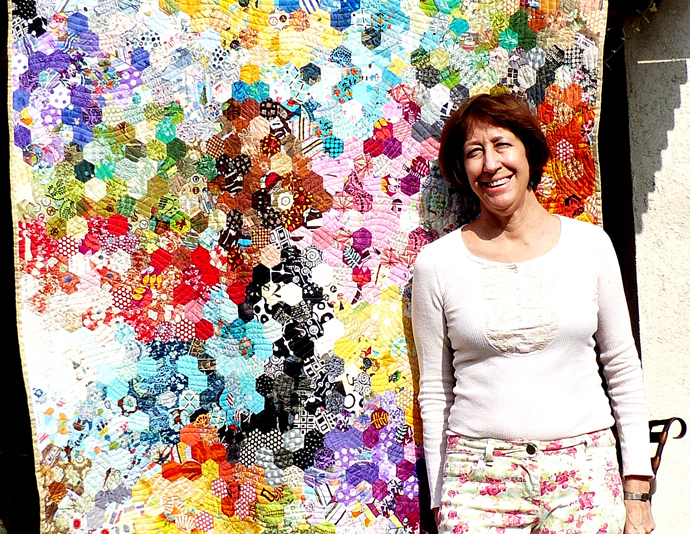 I'd recommend checking out Malka Dubrowski's improvisational quilting method. When you picture your quilt, what do you see? well GUESS WHAT. i googled her, and malka has a creative live class coming up on feb 2nd. and when i picture my quilt, i see tons of freeflowing crazy color, so i'll be tuning in. thank you! Well, I grew up with a mom who would make me clothes but preferred quilting, and I ended up being a person who will occasionally make quilts but prefers clothes. I did successfully complete one bed-sized quilt a few years ago, but the blocks were huge, and it was something I saw in a catalog that I'd wanted to copy for quite some time. I do have a little quilt going on now, mostly to use up random cotton scraps. But I'm basically just sewing little strips here and there between clothes/baby projects, and I took all the pressure away by deciding this is just going to be a quilt to throw on the floor and let the kiddo play on. So it's moving very slowly, but since it's interspersed with more typical projects, sewing all those little straight lines isn't driving me completely nuts. I totally feel your pain! I love quilts, the color combos that could never end, the intricate designs that draw your eye here then there until you just. CAN'T. STOP. WANTING! I actually cut our a simple, easy quilt pattern... about a year and a half ago. I got as far as attaching each tiny piece to another time piece before I quit. It was not fast, and so meticulous, and precision was needed. Le Sigh. BUT- I think you should do it, cuz then someday, someone else will yell at a younger generation for not appreciating the heirlooms you've made (will make (that quilt)). Boo-yah! Oona, I have heard rumors that cocktails and quilting don't mix very well! Although I have to say the thought of a genuine Oona Balloona Technicolor Dream Quilt has me a bit intrigued!! Sidenote: Can you please email me at pandorasews at gmail.com? I have some vintage fabrics I picked up in an estate sale lot recently that are screaming please send me to Oona! You can always test the waters/your patience with a quilted pillow before diving straight into a quilt. I love quilt-making on days when I just want to spend a few hours sewing but am having terrible sewing mojo, like messing up every garment I even look at. Doing a few straight lines then kind of restores peace in the universe (my mind). I made a quilt top four years ago. And it sits. In a closet. Un-quilted. Maybe I'll finish it one of these days. I've been saving scraps for as long as I've been sewing to make a color wheel quilt. Godspeed my friend! I freakin love quilting. I don't bother with a walking foot on the piecing of the top... I just use my 1/4" foot and go to town. For bigger quilts I have a longarmer in NC that I send my tops and backing to. She's awesome, and smart and sweet and affordable...Linda Lovett is her name. For wee bebeh quilts I use my walking foot or my sashiko needles to hand quilt. I'm looking forward to see your gorgeous quilt! I used to work at JoAnn's in high school so I was determined to try every crafty thing in the store. I attempted a small quilted pillow cover that I drafted myself..I got one row in and realized I was using the wrong seam allowance and ragequit. then I picked up one of their mini quilt kits and banged out the top in a few hours, and it's been sitting in my bag of UFOs for the last five years! the quilting itself wasn't too bad, and it's fun planning and coordinating fabrics! but for some reason batting, backing, and binding the whole thing was just too much for me. Well, I would say for SURE if you want to fall in love with quilting, DO NOT start with paper-pieced hexagons like the quilt you are jealous of. Maybe start with a whole cloth quilt or some nice wide stripes. Wowee I just love Leah's rainbow quilt!! I can see why you were seething with jealousy! I can't wait to see what your creativity and scraps come up with!! Marcie, Your love of color and color combination makes you a natural to move beyond just garment sewing! I can also see you getting into loom weaving... down the rabbit hole you go! please please please don't start quilting with this rainbow quilt. That's a bit like attempting couture on your first sewing make. But if you check out Kaffee Fassett's Caravan of Quilts there are a few equally colourful and much easier makes in there. Alternatively, there's Tula King's patterns which could be up your street too. After a lifetime of apparel sewing, I started quilting just last year with no idea if I would like it or not. I fell deeeeeeep in love with quilting. I find it the perfect combination of both left and right brain functions, constant fabric handling and machining. You can go with a long-term or short-term project, depending on your mood. For me, the best part is that I can just start something without a plan and see where the project goes. I'm along for the ride, and if I don't like the finished product, I can give it away--not something you can do with an ill-fitting dress. I also don't think anyone who sews is short on patience at all. Relatively speaking, ALL sewists have some degree of patience. Just give it a try! What in the world is there to lose? If you love playing with fabric, color, pattern, and texture(!) you will find enough joy in the bits and pieces of quilting to keep you going. Check out Victoria Findlay Wolfe's work with scraps and 15 minutes of sewing. Crazy what you can accomplish!